PhD candidate researcher Valentine Saasa demonstrating how to use the nanotechnology breathalyser prototype developed at the CSIR. 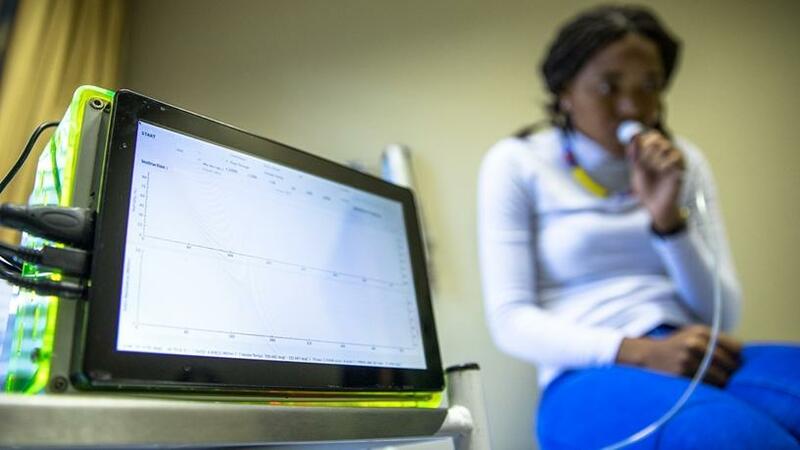 The Council for Scientific and Industrial Research (CSIR) has developed a diabetes-detecting chip to monitor blood sugar levels by analysing breath. Developed by 27-year-old PhD candidate researcher Valentine Saasa, the nanotechnology breathalyser aims to supplement, and eventually replace, the current invasive "finger prick" glucometer for monitoring diabetes. Sassa was speaking at the CSIR's offices in Pretoria yesterday on some of the health research being undertaken to improve the country's healthcare system. Currently, patients who are diagnosed with diabetes in SA have to prick their fingers three times a day to check their sugar levels. The new device allows a patient to blow into the device to receive their blood glucose results instead of using needles to draw blood. "This [traditional] method of monitoring and detecting diabetes is painful for the patient and could potentially introduce infections. The new solution is non-invasive and hence alleviates pain, as well as opportunistic infections. Many diabetes sufferers would prefer to monitor their sugar levels in a pain-free manner. The new technology is a direct response to these challenges which our citizens face daily. The breath analyser is based on a micro-nano chip composed of nanostructures," she said. Nanotechnology is science, engineering and technology conducted at the atomic and molecular scale. 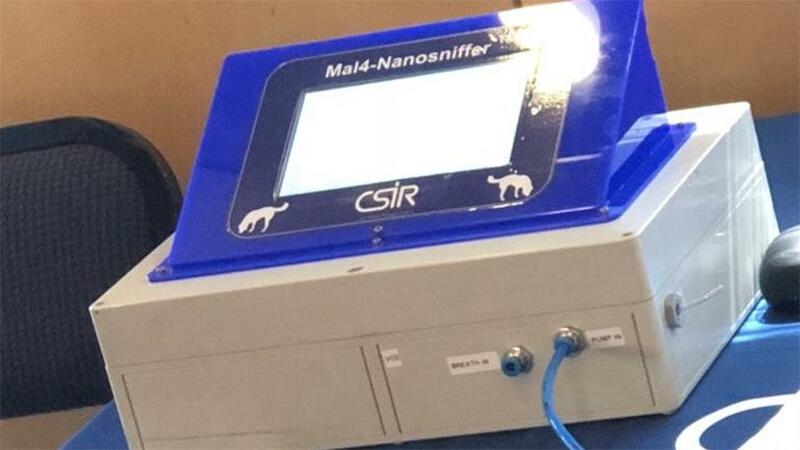 The nanotechnology breathalyser prototype developed at the CSIR for diabetes management. In 2015, the Department of Science and Technology partnered with the CSIR to establish a production facility for nanotechnology materials locally. The Nanomaterials Industrial Development Facility, which houses the infrastructure for scale-up, processing and testing of nanotechnology products, is where the prototype was fully developed. Sassa noted that research for the device started in 2014 following completion of her master's degree in science at the University of Johannesburg. The device uses extremely small materials to detect the levels of glucose in the body. According to Sassa, fabricating the material for the device is not difficult; however, the challenge is tailoring the technology to detect the specific molecule the team is interested in. "We spent a lot of time in the labs doing trial and error tests as well as changing materials until we got the right combination." With regards to market implementation of the product, Sassa says so far there are a few private companies interested in taking the prototype to market but nothing has been concluded. "However, we are getting the product market-ready as we already ran clinical trials at Johannesburg's Helen Joseph Hospital diabetic ward in 2016, which came back with satisfactory [results] and we are also looking at miniaturising the invention into a more portable device for easier market penetration. "The cost part of it is what will make this device a winner. Unlike the current glucometers on the market, the user will not have to spend money repeatedly on the glucometer strips which are quite pricey. Instead, the user will just blow into the device and wait for a reading. There are no additional expenses just a once-off payment for the device." The nanotechnology breathalyser is not the first of its kind. Last year, New England Breath Technologies, a US-based medical device start-up, developed a similar product, Glucair, which also uses breath analysis instead of blood for diabetes management.